Hello! Happy December! And we are still wrapping up November. BECAUSE we here at Just Around The Neighborhood are so bad at staying up to date with things! Over the month of November was filled with friends and family. Going home for a half a week was the most little slice of paradise. I can not wait to go home FOR A WHOLE WEEK in December. Seriously, to just hang out for a week sounds like a the best thing since sliced bread. It was so funny because this whole year I thought I would only have 1 or 2 days at Christmas, but I was a gatherer with my vacation days, so it all worked out! Anyways here is everything that got me through the month of November. Unfortunately, you can not link roller food from QT but that was really the MVP for the month. Eye Shadow// I am a creature of habit, so getting this palette was a great way to mix things up. Planner// As the year ending soon, so is my planner. I hate not having the next month on hand, but I realized how much I need it. Face Mask// Hands down the best way to refresh. 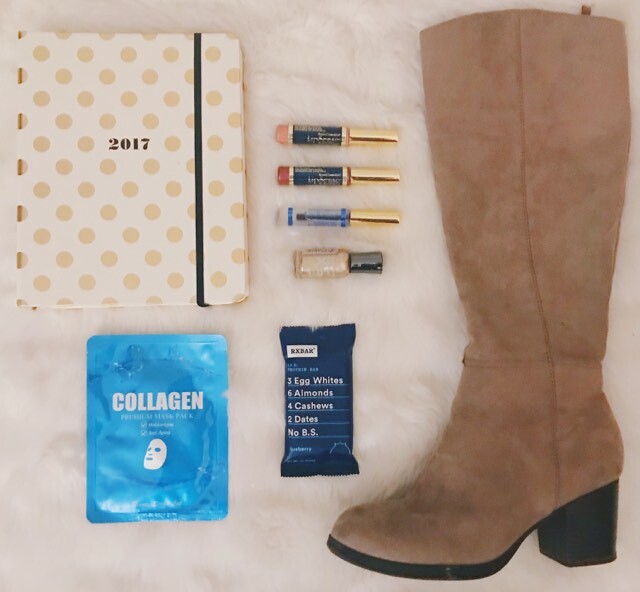 Over the Knee Boots// These make everything look put together, plus they give you a little height without making it hard to walk in. RXBAR// I always feel that the less the ingredients the better the food is for you. I love that it has 12g of protein and only 5 ingredients. Awesome post, I am in need of a planner. Thanks for sharing the one you have. The planner is super adorable! Love the polkadots.